Tomatoes are source of numerous vitamins and minerals, but also tomatoes are excellent source of quick energy for your body. Tomatoes contain natural fruit sugars, glucose and fructose, which provide the quick energy for the body. A cup of fresh tomatoes contains 28 calories, 2.5 grams of sugar and 1.5 grams of fiber. Tomatoes have a very small amount of fat and their cholesterol level is 0. They are an excellent source of antioxidants, fiber, minerals and vitamins. Because of all the nutrients they contain, many nutritionists include them in any diet to reduce cholesterol levels and weight loss. Tomatoes like many other fruits, such as oranges, strawberries etc… are great source of vitamin C. Consuming one cup of tomatoes are satisfying 32 percent of the daily needs for C vitamin for women and 13 percent for men. Vitamin C helps to absorb the iron in our body. Vitamin C is especially important for our health because it protect us against cold. Also tomatoes contain moderate amounts of B vitamins such as folic acid, niacin, thiamin, riboflavin and minerals. A cup of tomatoes provides 12 percent of the daily needs for vitamin B-6, which is really helpful for the brain function. 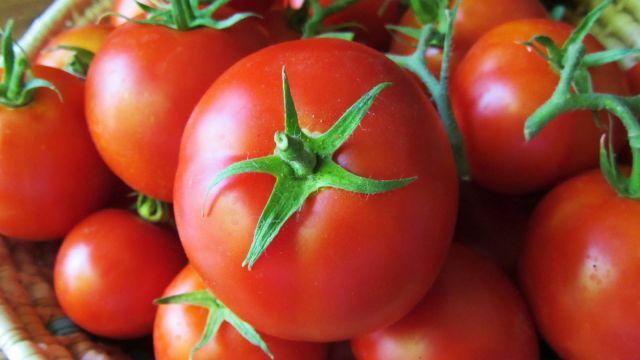 Vitamin A is present in tomatoes with the antioxidants. All together improve the vision and maintain the health of the mucous membrane and bone. All these nutrients that are present in tomatoes are stimulate the digestion, cleanse your intestines and maintaining your weight. Also tomatoes have positive affect on our mood. One tomato juice in the morning, gives you energy and help to reduce the stress. Tomatoes are one of the best sources of lycopene. Lycopene is a red pigment that is present in tomatoes, and provides the color of the tomatoes. The antioxidant properties of lycopene can protect our immune system from destructive free radicals, molecules that can damage cell DNA. According to the American Cancer Society, lycopene may help protect against some cancers, such as lung cancer and stomach cancer. If you are trying to reduce your weight, your diet is very important to your success. You should avoid foods that are high in saturated fats. Tomatoes are great for weight loss.